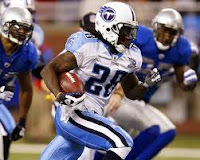 The next installment of the 2010 Koko fantasy rankings are the RBs. These projections are intended to establish the baseline minimum accuracy as the most reasonably naive predictions. The general explanation of the system along can be found in the 2009 QB post. Details on how RBs are projected can be found in the 2009 RB post. I tried to remove guys who are injured for the year or who have retired, but I may have missed someone. If you find one, just remember the classic line from Major League when Coach Lou Brown was given the list of players from the management. "This guy here is dead." "Well scratch him off then!" Weird. No idea how he got left off. I know there was an issue with him last year because there was the 'other' Adrian Peterson, but not this year. I'll re-check the data and insert him. How does Steve Slaton wind up at number 5? First off he's not the starter (if he is he's splitting carries)... also, he's never really been a top 10 guy, whats propping him up that high? I think there must be something wrong with the receiving TDs. You list the top guys getting 0.8 rec TDs per game...in last year's post, the top guys had about .15-.20 TDs per game. Slaton, for instance, had 4 rec TDs in 11 games last year. IDK how you can get 0.80 TDs per game as his forecast from that. You might be right. Let me check the equations. Fixed. My sincere apologies--I had built a script to do this automatically some time ago. It pulled last year's player data off of Yahoo, but they changed the order of a few of the columns since then. As you can tell I've been in a rush to get these out. Headed to the beach in a few days. Thanks for catching the bug, Zach. shonn greene not in the top 48? Phil, it's based solely on previous year stats. Greene will do much better than the model will predict because his usage will likely increase dramatically. i understand that... maybe im missing where Quinton Ganther did anything of note last year? also, why not incorporate playoff numbers (even though they dont count for fantasy, they give you a better sense of overall performance) when available?